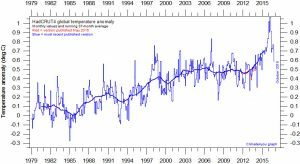 Over the last couple of years there have been many articles about how they have been record-breakers in global temperature. It’s often sold as a simple ‘the planet is getting warmer only because of us’ story … the concurrent El Nino was dismissed by some climate scientists as having an insignificant contribution to that record. However, there is a great deal of confusion and diversity in the assessment of its contribution. 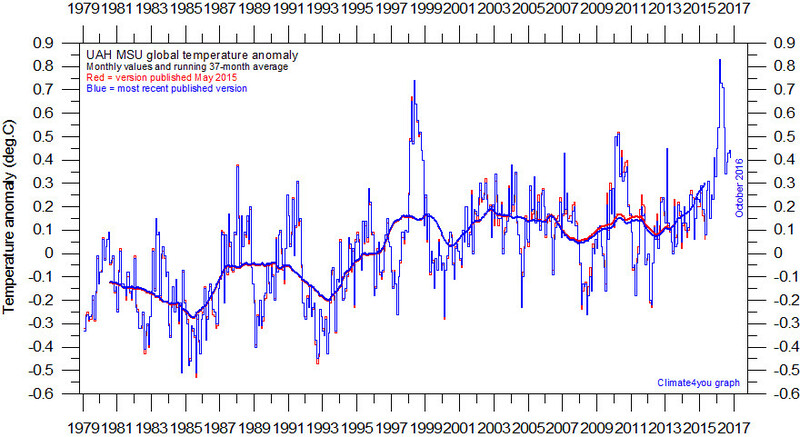 Some scientists maintain that it was the recent very strong El Nino that elevated the temperature to record levels. So it’s over, people. The recent “record” temperatures were caused by natural variability, not man-made global warming. 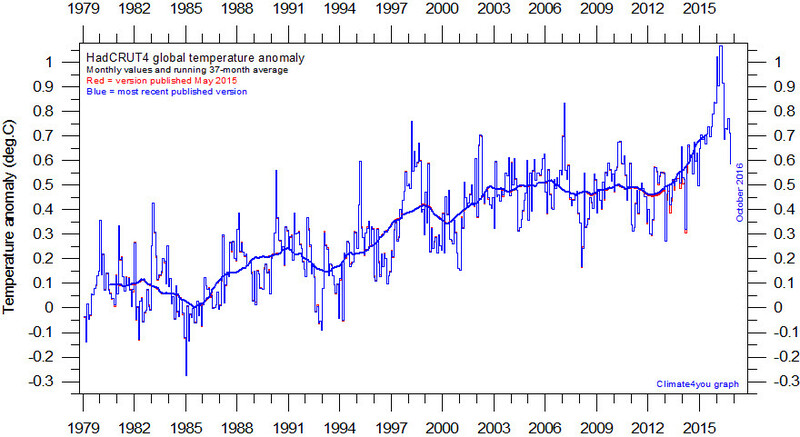 As you can see from the graphs, temperatures have returned to what they were before the El Nino. Notice how the so-called powerful man-made warming was easily engulfed by natural forces. It was no more than meagre. But did you think we said global warming was finished? We only said the El Nino was over. Who knows about global warming? We’ll have to wait and see. Here are two of those lying global data sets, for your convenience. The El Nino is all spent. No more high temperatures — what good news! You do agree? Some look to psychology to explain climate science’s poor communication. But when examining evidence, say for example a record of temperature, what psychological impulse is involved in accepting those observations over the contrary assertions of others? What psychology makes that credible? It looks to me less like a deficiency to be corrected than precisely that desire for truth we would, on all sides, declare for ourselves. That is of course manifested in speech. Science (which means knowledge)—is truth; psychology looks like speculation leavened with hope. Abuse, rancorous disparagement and dissembling are evil. Damn, I was hoping the El Nino would continue to enhance another one of our glorious NZ summers. Still, I’m sure all the extra CO2 in the air will help my veggie garden regardless, and the beach still looks inviting. You mean that the 2015/16 El Nino released more stored heat to space than in 1997/98 El Nino? Lucky we have El Nino’s to cool the Earth when it starts warming up. Yes, the trend is what we want but I don’t believe you can declare a trend on just two data points; have you done so? What do you mean by a larger event? Tamino doesn’t use the term; temperature is everything, I think. Generally, explanations of El Nino are impossible, since we don’t know what causes them. Do you agree? Lucky we have El Nino’s to cool the Earth when it starts warming up. Precisely! Good work! 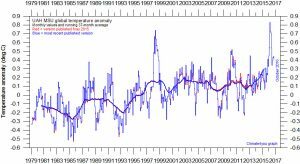 Simon tries to imply the El Nino permanently warms the earth, when the graph above clearly shows it’s transient, which means the El Nino cools the earth. Heard of negative feedback? 400 billion years of it? Thanks for the link. Yes, it needs a separate post, but I’m not sure I can investigate it. I didn’t find evidence straight away, which makes me nervous. Wakeupkiwi looks long on drama, short on research. Perhaps you could write it up with references and send it to me? Thanks, Richard. How can I get hold of you?